Google Play Music vs Spotify, Who's The Winner? Online Music Store Spotify vs Google Play Music, Who’s The Winner? 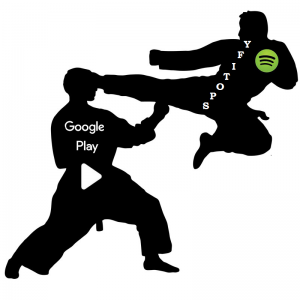 Spotify vs Google Play Music, Who’s The Winner? Finding the best music streaming services can be done by differentiating the various apps available for users to enjoy music throughout the world. 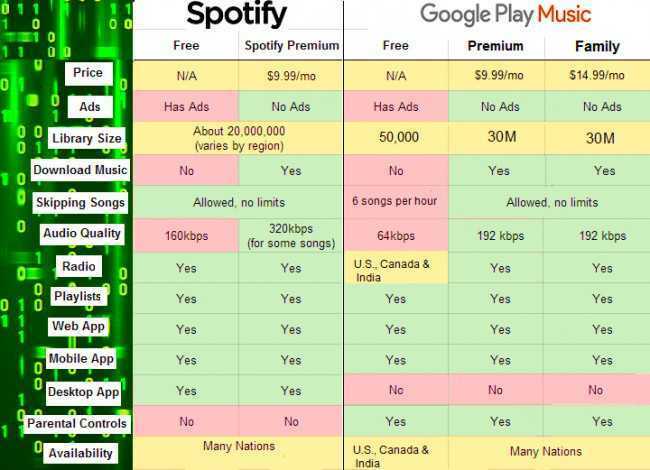 For Spotify and Google Play Music, here are a few differences that set each apart from the other. Spotify streaming model differs from Google Play Music by far. You can listen to music for free if you don’t mind occasional adverts now and then. With Google Play Music, you can listen only to individual albums or tracks you have bought, and pricing is competitive particularly when many albums are under $5 or the album of the week goes for just 99 cents. Spotify has three tiers; a free tier that’s ad-supported offering song selection, skipping tracks and saving limited music for offline listening. The premium tier goes for $9.99, and you get unlimited access to Spotify catalog, support your favorite artists, and be able to save tracks for offline listening. And finally the family tier that goes for $14.99 and a discount if five members of your family get accounts with Spotify. Google Play has a similar subscription but the free tier has limitations on how you use the service, and you have to listen to occasional adverts. Also, it does not offer student or family plan. Both can be used on the web and mobile through apps, but Spotify has a desktop application that can be downloaded for the Mac or PC and use them with or without a subscription. However, Spotify will let you use listen to songs on shuffle if you are using the free plan services. Spotify has more than 20m songs to stream and each day; the company adds around 20,000 each day to their catalog. Keep in mind that a majority of this music has never been listened to and though Google has less, quantity is not everything. Google Play gives you the ability to upload your existing music, backup, and listen to around 20,000 tracks appearing alongside your streaming content. Also, you can download content to listen offline by pinning it within the app which is similar to Spotify. But there are a few limitations like downloading up to 3,333 to each device as well as stay offline for up to 30 days. Though both of them offer content recommendations and radio stations based on the songs and artists you listen to, Google Play makes this service available if you pay monthly for Google Play All Access. The instant mix is a feature on Google Play that is same as a radio station but creates a playlist from your listening history and shows you what is coming next so you can skip forward. Bear in mind that Spotify and Google are compatible with speaker systems and other devices like Sonos, Apple TV, Google Chrome Cast, Roku Players, Smart TVs among others. However, compatibility varies- Spotify on Sonos requires a premium subscription. Compared to Google Play, Spotify has a better integration with social networks where you can post what you are listening to, see what your friends are enjoying on their end. Follow projects that artists are doing so you may not miss on new releases, and keep track of your streaming habits with popular integrations. With over 30 million tracks in it’s library, Spotify hosts a majority of songs that are popular right now. For Google Play, their tracks are a little bit less than for Spotify. Spotify has phenomenal Discover Weekly playlist and the best social sharing where every week, you get more than 30 new tracks to listen with Discover Weekly. Recently, they have released new ways of creating unique playlists that will aid you in discovering cool music. On the other hand, Google Play Music comes with YouTube Red where you can access original YouTube content, no ads or regular videos, and other awesome features. With Spotify, you can upload songs from your computer to your account and are stored there, unlike Google Play that stores your songs on a cloud drive. Once you buy a new phone or get another laptop, you can retrieve your favorites from the cloud drive that remain intact even on your absence. There is no easy way to decide on the best for streaming music because they have unique features users find attractive. Remember that everyperson has their taste and a preference such that, the bright colored design Google play has will not appeal to those who prefer a darker one. The subscription plans might be expensive, but the quality of music one attainsthe worth every penny they spend which is why users will prefer quality than quantity. An issue that Spotify should look into since their catalog is said to be more extended compared to Google play music.